Support the PBSO by Buying a New T-Shirt! October 19, 2017 / Lauren Koss / Comments Off on Support the PBSO by Buying a New T-Shirt! In its first 10 years PBSO has performed 72 concerts with 94 works by 52 composers; premiered 5 new compositions by Maine composers, and reached more than 2,000 children with 10 Music for Children performances. You can help assure that the next decade is rich with many more inspired performances by supporting the PBSO, and one great new way to do so is to purchase a PBSO T-shirt! 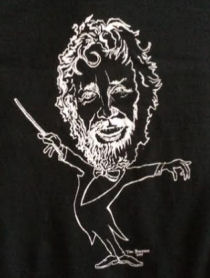 With your donation of $15 and $5 for shipping and handling, PBSO will send you a commemorative t-shirt, which is black and features a caricature (created by local artist Tom Brennan) of conductor and music director Trond Saeverud. To order your shirt, please make your check payable to PBSO, print and complete this form, and mail both to: PBSO, PO Box 114, Eastport, ME 04631.